A pretty simple, yet intense movie about what humans will do to each other when bored and on the open road, away from civilization. 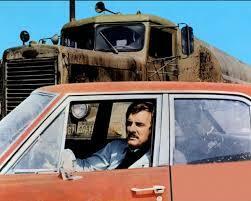 Duel is a movie about a one on one showdown between a businessman and a truck driver. It’s a movie about being terrorized on the road, up in the mountains, away from towns and people. The movie starts out with a man driving around listening to a radio, enjoying himself. Before long he comes up behind a truck that is not only moving very slowly, but is also putting tons of smoke into the air. The man passes the truck, and that’s where the problems begin. The truck speeds up and comes right behind the man and then passes him again. Only as soon as he gets in front of the man, it slows down again, as if to say “I’m not going to let you go in front of me, but I’m also going to go nice and slow and keep you behind me.” the man talks out loud to himself about what the truck driver is doing and how he can’t believe it, and it’s a good thing, because if not for that there would be no speaking for what is probably the whole first portion of the movie. All of this back and forth goes on for a while until the man pulls over at a gas station and goes in to use the pay phone. He calls his wife and we listen to their conversation about they had a fight last night, and about what time the man expects to be home. And while he’s standing there, at the phone, we see the glass door behind him, off in the background. And through the glass we can see the truck pull up right outside the door. It’s a pretty masterful shot. This movie was directed by Steven Spielberg, and it was a made for TV movie, but also Spielberg’s first feature length film. Before this, he had only made shorts, which he had, been doing since he was a kid. As a child, he made the World War II movie, escape to nowhere. Then, as a young adult, he made the short film called Amblin, which he later named his production company after. And now, with duel, he made his first full-length movie, even if it was made for TV. Not long after this, he made the Goldie Hawn movie, the Sugarland express, and from there, he was on his way. Duel shows a lot of promise for Spielberg as a director. For one thing, it is very simple and bare bones, like what you see is what you get. In that case, it kind of reminds me of the sort of movie Hitchcock would make, experimental in just how much he could get away with using limited sets. Movies like lifeboat, where the entire film took place on a single raft out at sea. Like any great filmmaker, Spielberg knew even from early on, that the stakes needed to get higher and higher as the film went on. And so they did, with this movie, gradually at first. The man leaves the gas station and gets back on the road, and the truck starts following him. The truck goes in front of him and does the usual slow down technique, right after he passes him again. After a while the truck waves the man to go on ahead of him, and right when the man starts to do this, a car comes whizzing by in the other lane, where the man was headed. The truck driver tried to kill him, telling him to go into what would have been a head on collision! As this goes on more, the truck driver starts to get increasingly more physical. When the man tries to pass him, the truck starts weaving into the other lane, making it so that the man can’t get by. There are rocky mountains right alongside them and the man starts to wonder if he tries to get past the truck, will the truck just slam him right into the mountainside. We wonder that too. The man stops at a bar / restaurant road stop and so does the truck. The man orders a sandwich and sits there, at the bar, looking over the customers. He looks at their cowboy boots, knowing from the previous gas station that the truck driver wears cowboy boots. And the man looks over each person at the place, trying to figure out who his man is. At one point, he even gets up and approaches someone at a table, provoking a fistfight. But none of it works, and no sooner does the man get on the road again, then the truck comes up right behind him. There’s a lot of repetition here, but luckily the man makes certain stops that add to the story. The restaurant was one of these stops and a gas station / pet farm is another one. The woman who runs the place comes out to help the man, only all he really wants is to use the pay phone. He gets inside the booth and dials the police, only before he gives his information to the operator; the truck shows up and drives right through the phone booth. Luckily the man gets out alive, but then the truck comes back again and again, driving right through all of the snake cages, trying to run over the man or cause as much destruction as he can. This movie is very clever in the way that it never shows us the villain. 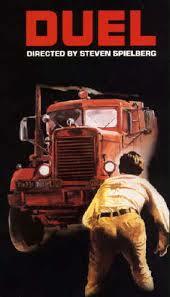 Even by the end of the film, all we have seen is his truck, his hand, and his boots. That makes the enemy a whole lot scarier, because the only thing we see to represent the villain is this huge, ugly, monstrous truck. This is a pretty cool paranoid movie. It’s one of those movies where the main character is up against someone crazy, but it seems that nobody will believe him. There are a lot of close-ups that show eyes and sweat rolling down foreheads, and things like that. The movie is definitely one-noted and a little too simple, but it is still pretty entertaining. It couldn’t have been easy to make a movie like this and to keep it interesting the whole time, yet the young Steven Spielberg pulled it off. It was the first of many successes in the director’s long lasting career.